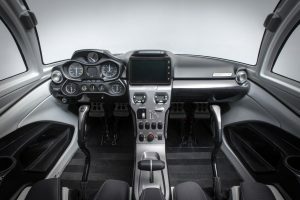 Prestige Imports has a lot of exotic cars in its North Miami Beach showroom, but the new centerpiece is the Icon A5 aircraft, which can take off and land on either water or land. 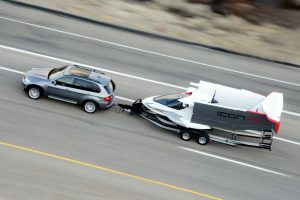 Prestige announced it has a new partnership with Icon Aircraft to offer the A5, a two-seater that can go up to 109 mph. The A5 requires only a sport pilot license to fly, which takes about half as long as a private pilot license to earn. Among the interesting features in the A5 are a spin-resistant airframe, a low stall speed, a whole plane parachute system and an angle of attack indicator. The wings also fold back to it can be towed by a car or truck. 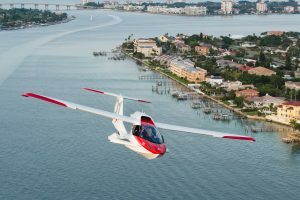 The manufacturer’s website lists the cost of the Icon A5 Limited Edition as $389,000 with delivery available in mid-2019. David was previously interviewed as part of SFBW’s CEO Connect series. He took over the family dealership at the age of 19 after his father died of a heart attack. At the time of the interview, Prestige’s Lamborghini had a string of 15 years at the automaker’s top-volume dealership globally. Among David’s coups were getting one of the first three Pagano dealerships in the United States. 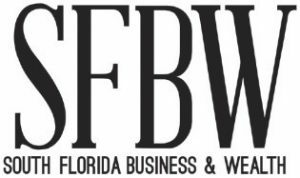 Prestige Imports is at 14800 Biscayne Blvd. Through the end of April, Icon is offering a special Mentor Pilot Program that includes up to $15,000 of credit toward an Icon flight Instructor in the first year of ownership with the purchase of an A5.